5,000 Facebook fans is something to seriously celebrate! We love the support that we get from our facebook community and want to share the love by giving away an AWESOME prize to one of those fans. Our facebook page is where we share details on our new classes, post pictures of what’s happening at MTC, and get awesome feed back from people everywhere! We are so grateful for the tremendous amount of support and the outpouring of love we see on our page every day! Pinterest is well known for being the place where connoisseurs of the latest and greatest information get lost in endless pages of ideas, projects, and graphics. Most people use it as a way to explore their hobbies, but did you know that Pinterest can also be used as an effective tool for marketing, collaborating, and even research? Why should I use another social media platform? My absolute favorite use for Pinterest is to collaborate! Now, of course it is hugely beneficial to collaborate with local professionals when you can, but in the case that those resources are not present or available Pinterest allows you to share ideas with others, professionals included! But more than anything else, Pinterest is a great tool for advocating! There are already pages upon pages of informational graphics about what Music Therapy is, who provides Music Therapy, and why it is effective. When these images are re-pinned they become more and more popular and are then seen more and more. 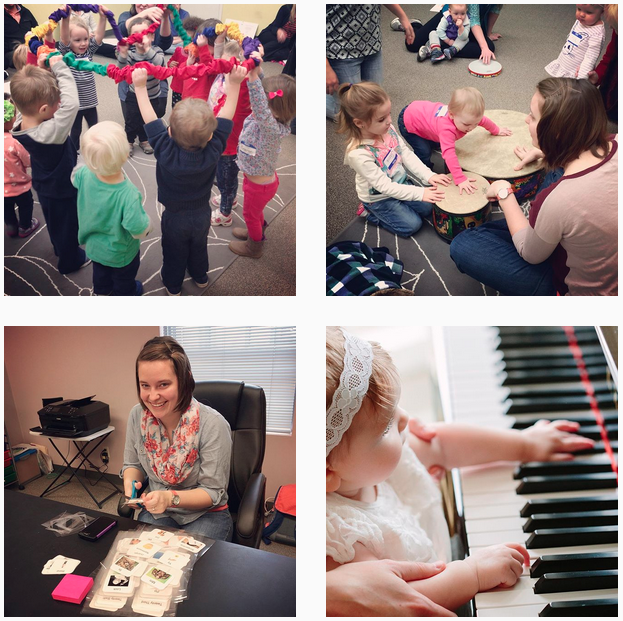 In the end there are so many uses and benefits to using Pinterest as a Music Therapist that I didn’t even touch on. Curious to know what comes with our NEW multimedia songbook, “Counting Through the Seasons”? Check out the video below to get a sneak peek at one of the songs and learn more about everything you get with your digital download!! Our mission is to help children learn and grow through music, and that is certainly the focus when designing and facilitating our classes. There are so many other magical things happening as a result: parents making special connections with their children, grandparents having precious one-on-one time with their grandchildren, siblings sharing instruments, and new friendships being formed. Music brings people together in a way that nothing else does. So while we are teaching and strengthening important developmental skills through our songs and activities, the beautiful byproduct is stronger relationships between children, their grownups, and their peers. I spend countless hours with my children, but there’s something special about attending music class with them. We interact in a different way than we do at home, and I love seeing both my toddler son and infant daughter interact with the other children and adults in class. It really is the highlight of our week, and I hear from other families that the same is true for them. I often use words like fostering, supporting, and the big one — facilitating — when discussing the purposes of Music Therapy and how music can be therapeutic. I work alongside our clients to support them in growth and achievement of their goals and consider the environment, instruments used, methods applied, music played and assimilate them into one experience. I invest in them so that they will succeed. But it occurred to me the other day: when am I investing in myself, and is it enough? The simple answer was rarely, and no. Now, I am not talking about your standard self-care plan, which usually consists of exercising, watching a movie, or going to bed an hour early just because. Though these things are important, I am talking about the other side of self-care: artistry. You are an artist. Say it with me: I am an artist. If you chose a profession in music, you did it for a reason. This realization hit me like a ton of bricks, but then something amazing happened: “You know what, I AM an artist.” It was in that moment that I realized that I had been neglecting my passion for music. I chose then and there to set aside five minutes every day to play one song that I love, or write, or something that was just for me that was far far far away from “Old MacDonald”. I took this time to facilitate artistry in myself, I provided an environment, chose instruments, applied methods, and played music which seamlessly assimilated into one experience. How are fostering artistry within yourself?